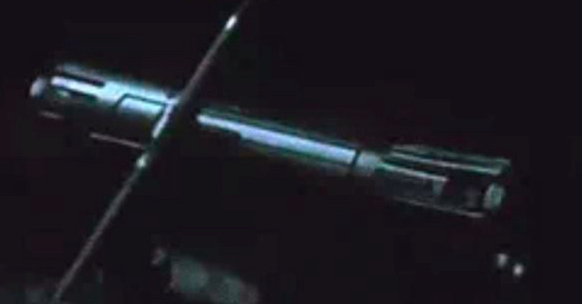 Is Anakin’s saber the one Ben has in the flashback? Oh, I only saw the movie once so I assumed it was. I guess he had his own. I also don't think Kylo planned his "coup" this way at all, so he wasn't steps ahead and had no plan. His emotions, particularly after Rey rejected him, didn't let him make a good one on the fly. He refused to kill Rey in the moment and turned on Snoke instead, but it wasn't a premeditated thing. Then after it was done, he turned to Rey and hoped she would join him and they'd figure it out from there. Then after that didn't work out, it seems like he was just like "Welp, guess I'm Supreme Leader now. Screw everyone and everything, let's destroy the Resistance." While I agree that it wasn't exactly planned and he acted at that moment because he wasn't about to kill Rey, I think the seeds were planted before and he got the conviction to do it because of his vision and connection with Rey. He saw a future where she'd turn and stand with him. When she came to him , he took his chance. He didn't want to be Supreme Leader of the FO. He wanted to destroy it all and start something new (with Rey). He's going to be miserable as Supreme Leader. I was thinking about it and Rey said to Luke - you took decision for him, but she did the same with Kylo and that is why she felt crushed because the fantasy she imagined didn't turn out. I think she also needs to realize that. That Ben didn't fail her as much as her emotions did and the fact that she didn't get the saber, but it was torn apart between them showed that she wasn't exactly right. Neither was he. 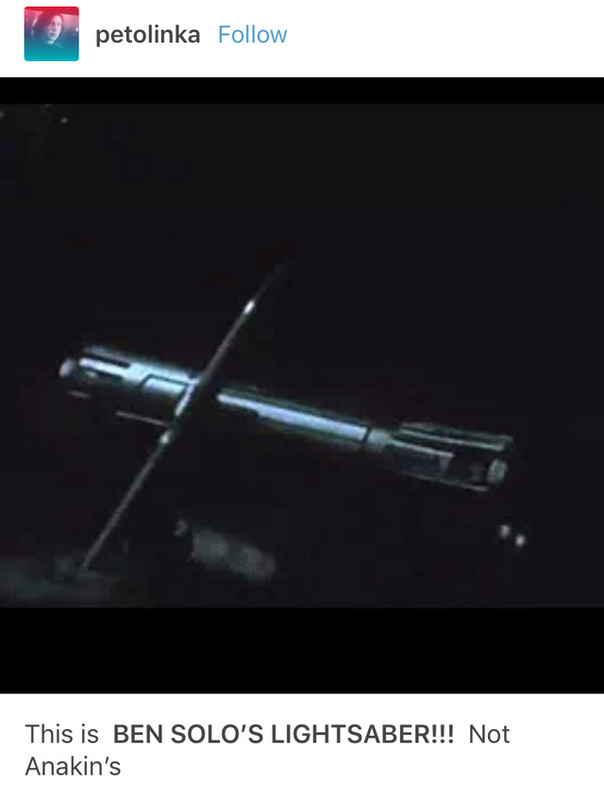 I wonder how many people actually understood the symbolism of the legacy saber breaking in two instead of going to Rey as it did in TFA. Because I can see how many people will take that last shot in the Falcon as “tada, here are the good guys to root for” forgetting that the protagonist only has a broken saber in her possession now because the force decided that she did not deserve it more than big baddie Ben. Even I must admit that I am a bit insecure with that scene and have to remind myself that Rey does not exactly look like she’s belonging, alone on her bench. As a Force sensitive warrior Rey's whole story goes a lot deeper than her affiliation with the Resistance. She genuinely wants to help them because she's a very compassionate person and she has bonds with Finn and Leia, but the truest connection she formed over the course of TFA and TLJ was to Ben Solo. She was called into the fight by his old lightsaber, she experienced a vision that was pretty much all about him, she was confronted by him and overcame him and then had to reconcile with the fact that he was not simply evil, that the events of his past and struggles with his imperfect family aided in his creation as much as Snoke's predation. The movie does not deny that, either. It's very front-and-centre, which I liked. Everything she experienced with Kylo was incredibly personal. Their bond is as integral to their future as Luke and Vader's was after Empire. Kylo is a villain with a connection to a heroine and Rey is a heroine who discovered her truest link will always be with him (with Ben). The only witnesses lost their lives, leaving the apprentices completely alone once again. Rey will never find belonging in the Resistance. It's not who she is. It's so true that the most intimate connection she's had is with Ben. Even in her second closet relationship, which is her friendship with Finn, they don't really know each other. Finn doesn't know her innermost feelings or fears, and I'm not even sure he knows about her Force sensitivity or what it means. And Poe? Lol, all he knows is her name is Rey. Even in TFA, Kylo was the only one present for Rey's discovery of her Force powers. He knows her inner most fears and dreams. There's no way that connection won't be important in Episode IX. It's the MOST important connection Rey has in the entire trilogy. Seriously, anyone trying to see these two aren't endgame af are on denial pills. The same ones they took to believe in ReySky for two years. I guess it’s a matter of visual coding. When you see a group of people in the MF, your mind jumps to good guys to root for especially when you follow that scene by a boy with a Resistance ring. I guess that after having seen the movie 3 times now, it’s my only real annoyance with it. The ending plays too much on the cliche “Vive la Résistance” and I just want to say “Screw the Resistance” which is the weirdest feeling, as a French person nonetheless. I think the last shot being the broken saber would have been perfect to finish on the same ambiguous tone as the rest of the movie. But hey, it is what it is and I am loving more and more what we got. @SanghaRen wrote: I guess it’s a matter of visual coding. When you see a group of people in the MF, your mind jumps to good guys to root for especially when you follow that scene by a boy with a Resistance ring. I guess that after having seen the movie 3 times now, it’s my only real annoyance with it. The ending plays too much on the cliche “Vive la Résistance” and I just want to say “Screw the Resistance” which is the weirdest feeling, as a French person nonetheless. I think the last shot being the broken saber would have been perfect to finish on the same ambiguous tone as the rest of the movie. But hey, it is what it is and I am loving more and more what we got. Kylo's now the last Skywalker so anybody who wants a happy ending better be invested in his future. I think it was Rian's mistake to trust the audience to grasp ambiguities. Kylo is a flipping mess whose whole family failed him as he was being preyed upon by a disgusting "Let me run my hand across your cheek, 'child'" humanoid alien. It's not as simple as vive la Resistance vs. die Kylo die. We had Hux up leading the battle to juxtaposing Kylo's emotional breakdown on the ground. Kind of random, but the throne room was amazing. The red walls engulfing Rey and Kylo as the fight back-to-back. So symbolic. Kylo's last scene, him on the ground wincing as Rey closes the door on him, is the best source of hope for me right now. In his face you can clearly see his regret. He knows he messed up. He's not some irredeemable one-dimensional villain cackling away. Even in the very last second he's trying to reconcile his choices. It's also reassuring that with Snoke's death, their bond still stands. The first time I saw it I thought Rey's face while closing the door was really cold, but after seeing it two more times I didn't read her face as harsh. She's disappointed to be sure, but it also read very much as unfinished business between the two. Luke and Ben's whole closing sequence was a source of hope for me, as well as Luke's "no one is ever really gone" reassurance to Leia. He was talking about himself and Ben. Luke had a plan and when he connected with the Force he became ultra-aware. He knows that Kylo won't bring an end to the Jedi and that he'll never destroy Rey. I took Kylo and Luke confrontation no matter how weird it were and Luke's words as hope that ŕedemption will happen. I must admit I did not get exactly that from Rey who had cold, stern, you don't deserve me look towards Kylo. Kylo was a little angry towards himself and everyone, sad, bitter, regret but accepted what is coming. He'll be alone as Supreme Leader Ren. Her journey in this film ends with her holding the two halves of the saber. Nobody has given up, but thanks to Luke the light survived to see the next confrontation. We'll get our happy ending. I wrote about how I was disappointed with the soundtrack in another thread, but interestingly enough my favorite musical moment was when Luke said, "No one is ever really gone". There was a new set of notes there, it had a bittersweet resolution. I want to think it's a hinted redeemed Ben Solo theme, but I don't know. It just felt warm and reassuring. @Night Huntress wrote: OK, so I had a little time thinking about Kylo/Ben in TLJ. I do feel compassion for him, because he was abandoned and betrayed by his family and targeted by a dark evil predator since his childhood. On the other hand... does this really justify his action at the end of VIII? A lot of people have a bad childhood - it's not an excuse for becoming an murderer. And sadly that's what he did to Han and wanted to do with the few people left of the resistance. It had nothing to do with war - it felt for me like kicking someone that already is on the ground. That's why I'm not sure I would be fine with him being redeemed anymore. For me they overdid it... if he woke up in the throne room declared himself the new Supreme Leader but left the resistance alone- yes, that would have worked for me. He could have said something like "stop the attack, they're of no consequence or irrelevant" - the movie should have ended than- That fight on Crait was too much. After being humiliated by his uncle (who absolutely deserved being the target of Ben's anger) in front of his troops, he dropped to his knees and let the Resistance go, rather than shouting outside where the Falcon was and to pursue them or anything. That doesn't scream cold-blooded murderer to me. This is not especially aimed at ISeeAnIsland - if anyone can answer this please do.. I've only seen the movie once - Did Kylo let the resistance go at the end? I'm thinking Kylo entered the stronghold to find they had evacuated... he looks down, picks up the dice..
Rey and the MF are off in the distance at the end of the caves they followed the wolves through. When the MF flew in and found them they were surrounded by mountains - it gave the impression they had travelled quite a distance. Maybe I've misunderstood what I saw, but I'm thinking that the resistance escaped, rather than Kylo letting them get away. Oh how I wish I had seen Kylo letting them get away!!!! but.. I am resigned that the big signs of his approaching redemption are in IX. have I misunderstood the ending? My impression was that Kylo did not purposely let the Resistance go. I think they escaped because Luke was able to stall Kylo and the First Order, thus giving the Resistance time to get away. I think by the time Kylo actually entered the base, the Resistance people had already evacuated it. I'm actually not sure about the dice. Luke gave them to Leia, but I'm not sure if she dropped them or maybe she knew they were just a hologram projection and she couldn't take them with her so left them behind? I'm really not sure. He knew they were with Rey, he knew they were on the Falcon. He could have ordered them to destroy the Falcon as soon as it left Crait. But he didn't, because Rey was on it. That was my take. He was so overcome by his grief that he just let them go. I never thought that he "let them escape" in the sense that the let them get to the Falcon, but at the end, he finds Rey, he knows where they are, and he's just a wreck on his knees. He wasn't the same man there as he was when he was raging in his shuttle with the "destroy them all" attitude. And at the end, once he had come out of that rage, he didn't have anything left to go after them or send anyone after them as the Falcon escaped. I mean, if Hux was the one who knew the location, is there any doubt that he would have sent ships after them to blow the Falcon out of the sky? Speaking of last Skywalker, my Kylo-hating boss told me last week, before any of us had seen the movie, that he hoped there wouldn’t be too many scenes with that lame Kylo. And I was like “Don’t count on it, he’s the last Skywalker, you better prepare yourself for it.” He did not even try to fight it this time and just went “Sh***, I guess I won’t like the movie.” “Chances are high, you won’t.” I am bracing for the amount of complaints. I wish I had a t-shirt “Long live the Supreme Leader Kylo Ren”. As someone else said he comes out of this film with a body count of Snoke. He's furious and heartbroken at the end, but he's all talk. He's barely holding it together. Although he and Rey attempt to sway the other using their own tactics (Rey tries to coax the light out of Ben and Kylo tries to appeal to the darkness in her) Kylo doesn't do anything particularly "evil". Ambiguous, sure. But not evil. I'm sure people see his redemption as inevitable now because he's the last Skywalker. I disagree with the body count. Don’t forget he shot in the hangar with his ship killing plenty of pilots plus some people at Crait that were shot because he gave the order. Not that I am trying to make him look bad - as if -, but let’s not reduce his deeds. They all have high body counts on both sides. Wasn't everybody inside the base by the time he ordered the shooting? He was ordering them to shoot at Luke, who wasn't even really there. Kylo didn't arrive on the battlefield until the final confrontation. He sent Ties after the Falcon, but that was for nothing. I forgot about the ship hangar, you're right about that. There was a lot of war scenes in this film. I've only seen it once. What I mean to say is there's no "village massacre" or "Han slaying". It was a war movie. I'm not trying to "reduce" anything. As if I would ever. I'm just trying to explain why many would see Kylo as more redeemable after this film in comparison to TFA despite the fact that he's still a villain at the end of both. Oh, I know, you’re not reducing anything. I just saw that body count being mentioned a few times and it’s a discussion I don’t like because it leads to weird discussions on which lives count. It’s war. They all shoot on people. No one is innocent and everyone kills. And yes there were speeders on Crait with people in them trying to take down that big door opener and he said they should concentrate the fire on them leading to Poe disengaging. But then Poe had plenty of comrades killed in the first part of the movie and the Finn mission he so eagerly agreed to backfired big time leading to more dead people - but freed fathiers . So yeah, it’s war. I took it as a foreshadowing much like Kylo talking about force projection that could've killed Rey. I wonder what is symbolic behind it. Is that Rey has to rebuild Jedi order, broken relationship with Kylo/Ben or something else? I guess, it could be combination of all of it. I could be wrong, but I got the sense that everyone except Luke[how ironic] gave up on Kylo/Ben. Of course Luke reignited hope in the Rebellion, the Jedi and that Ben might return. Leia said it how Ben is gone, Rey gave him that look that he is truly gone and lost. It has to be Ben vs Kylo who wins he'll have to fight that fight on his own and wins it. What I don't like but understand is that possible time gap in the story. it happened after ANH like 3 or 4 years, here we might have that or more. ging Rey to the age of Luke and Anakin during the third movie. When it comes to the ending. I don't have expectations and headcanons about it anymore for my own sake and to enjoy the movie. My expectations and headcanons ruined it for me more than any real spoilers. I'm sure they'll finish it well but wonder how much "safe" is JJ going to play it. If TFA is any indication, they might. I have my wishes to not repeat OT ending, but honestly don't know, and I'll let them do it- then watch it. No expectations = no harm. My new policy. By the end Kylo isn't Vader, he's his own person. He still has the weight of his family hovering over him, but while Vader was all about control, Kylo became what he did as a result of losing Rey. He went from one crutch (Snoke) to another (Rey). 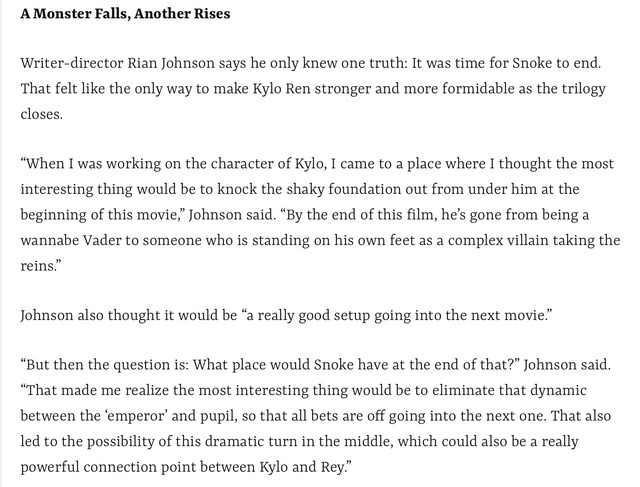 If Rian wanted to portray Kylo as someone standing on his own feet and taking the reins as a more powerful villain by the very end of TLJ...I don't think he succeeded. The guy went on an unreasonable rampage and ended the movie on his knees looking broken. When he took that stand against Snoke, it was a moment of strength, control, and discipline that we'd never seen from Kylo. THAT was when he was standing on his own two feet and taking the reins for the first time possibly ever. But then the entire thing got shot to pieces when Rey rejected him, and he progressively fell apart from there. I thought that was the point...? If that wasn't Rian's intention, then I'm awfully confused at the direction of that final battle. Just replying to compare. 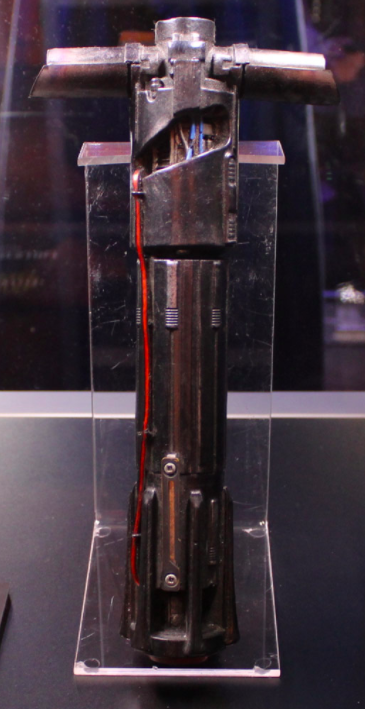 It looks as though Kylo made his crossguard out of his old lightsaber. Or at the very least designed the crossguard off his blue saber. Same design for sure. Yeah, the usual layer of interpretations reporters should avoid to inject in their articles. Just like the dumb title of the paragraph. RJ never says “monster”. I try to keep to the quotes in such articles because we’ve had enough headaches due to reporters including their headcanons in articles. Haha! I was rewatching the outtakes auf that- and laughed as he was asked "are you married" and he said: "divorced" ! Foreshadowing?? ?